You are here: Home / BLOG / Uncategorized / MORE Hott FelTiNG, now with COLORS! MORE Hott FelTiNG, now with COLORS! Well, I am exceptionally pleased with the swatching! 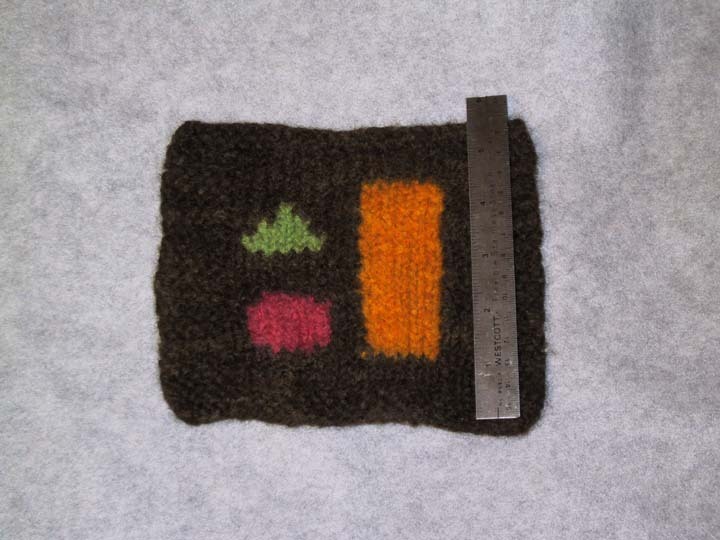 I did a swatch for felted intarsia, using the Rainbow of Wooly Flavors. These are the yarns, rolled into balls for better perspective. I cast on 21 stitches (I think) on #10.5 needles, and made a swatch 6.5″ square, with three figures: a Golden Yellow rectangle 4″ tall and 1.5″ wide (22 rows, 5 stitches), a Scarlet circle 5 stitches by 6 rows, and an Emerald triangle 5 stitches by 6 rows. The background is Olive. The “Before” guage, is 3.33 stitches to the inch, 5.5 rows to the inch. This is the front side. I had some tension problems; it’s the first time I’ve ever done intarsia, so I’m not gonna beat myself up about that. This is the back, so that some of y’all who have done intarsia, can check my work… the places where the shapes sloped inward, were hard! And I hate weaving the ends. This is after about 8-10 minutes of agitation. I was pleased to see that many of the tension irregularities have smoothed out; I think that blocking would have been effective if I weren’t felting this. Stitch definition is still strong. Notice the shrinkage – it’s lost less than an inch of height at this point. Another 8 or ten minutes of agitation. Felting is much more noticeable, stitch definition is fading away. Height lost, about an inch and a half. Another 8 minutes or so of agitation, and I’m calling it done. Stitches are pretty much indistinguishable, the fabric is thick and solid, and it seems pretty “done.” Total height lost: 1 3/4 inches. Total width lost: 3/4 inches. I love how the twisted joins show up on the back all around, giving the shapes a dotted outline. Could be used for effect if done on the good side. It’s better on the straight lines. Closeup of the front after felting. The “After” gauge is 3.6 stitches to the inch, and 8 rows to the inch. The round shape seems to show the most distortion, although all three shapes were obviously distorted in proportion to the directional shrinkage. Now, I just gotta go whip up some 8×3.6 graph paper, do some serious graphing, and figure out what I’m gonna make!! 0 0 Michael Michael2004-01-27 23:35:002004-01-27 23:35:00MORE Hott FelTiNG, now with COLORS! Can ya teach me how to do that? I can certainly teach it… do you already know how to knit? Well, the intarsia is a little tricky, but it’s all just knit stitch and purl stitch. You have to deal with all the little hangy-down bobbin things. You can do felted stuff without having to deal with the multi-color, too… I don’t know what part it is you want to learn, or if it’s just the whole process. And the WIR wants to know if acid dyes are scary to use. So far we’ve only delved into Kool-Aid! Sure, add away! I’d love to see. Who’s the WIR? Acid dyes are about as complicated as the Kool-Aid, except that you have to add the acid (the Kool-Aid has citric and malic acids to make it tart). It couldn’t get much easier than this stuff. Ok, you’re added and have access to super secret yarn Pr0n. I’m amazed by multi-color work. One of these days I’m going to get up my nerve and learn how to make a full fledged intarsia sweater or something and learn to knit holding yarn in both hands. For now I’ll stick to single colors, maybe some stripes, and cables. I found the both-hands technique tedious; I have done enough swatching of stranded stuff to know how it works, just not enough for a real piece. After I get a couple of Fel-tarsia pieces done, I want to try for FFI (Felted Fair Isle) – or maybe go for a more Nordic style, without the subtle (PITA) shading. LOVE the Aran sample throw on your webpage! That looks like something I need to do. I’ve done a few basic cables, just trying things out, but haven’t yet figured out how to do the complicated twisty ones that I really enjoy looking at in others’ work. Hope you don’t mind if I add you to my reading list? Oh no. I don’t mind if you add me to your list and I’ll do the same. It’s rare to find other gay guys that knit. That cable afghan is really my first big delve into cables. It was a little tedious and I’m not really into tedium. It was a good learning experience though. My website isn’t really much of a website. I just use it to park pictures that I want to post in my livejournal. That’s probably a little over-obvious but I’ve only just found your journal (thanks for adding me – I’ve added you in return with pleasure). I have cupboards full of yarn. I crochet – sometimes obsessionally. I dream of felt and dye. Not sure how good at it I really am though. There is a yarn shop in Prague that has reduced newcomers to tears. It’s filled with Italian yarns that the owner winds together to order. You can get a thread of mohair with a thread of leather (never worked out if it’s real leather, but it feels great) and a thread of linen. I had to stop myself going there in the end, I was beginning to feel like a yarn-stalker. The woman who founded the shop told a friend of mine that when she began she could only afford to rent a shop or a flat, not both. So she rented the shop and slept on the floor at nights – for some years. Now she has two branches and is beginning to design her own fabrics too. Long live the tradtion of knitting here – it’s one reason I love the place. Re: You are a knitter! I very much enjoyed looking at the pictures in your journal; turned me on to it. Neat story about the shop; I wish we had something more like that around here. Although there are a couple of yarn shops, they’re pretty much all major-brand stuff, not a lot of creative initiative. My knitting kick started with teaching myself Continental style after coming back from Peru this October; I’ve knit a LOT of things since then! I need to start actually tracking them, but haven’t gotten around to it. Four pairs of bed socks, three adult and two baby hats, four small and two large felted bags, and several (varyingly successful) attempts to recreate my Grandma’s houseshoe pattern. The needles, they have been busy! Nice to have you on The List, and I look forward to seeing more of your work and writings!